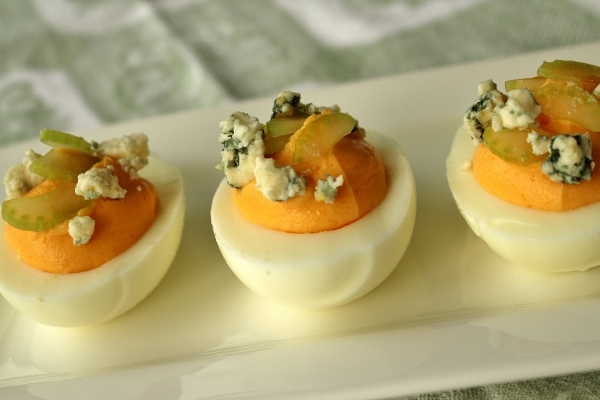 Adding a Patriotic flair to an upcoming Olympics gathering is easy with these Buffalo deviled eggs. I'm a fan of all things Buffalo, with the exception of their football team, of course. Go Patriots! There are so many things you can do with this flavor profile, and all of them are excellent. 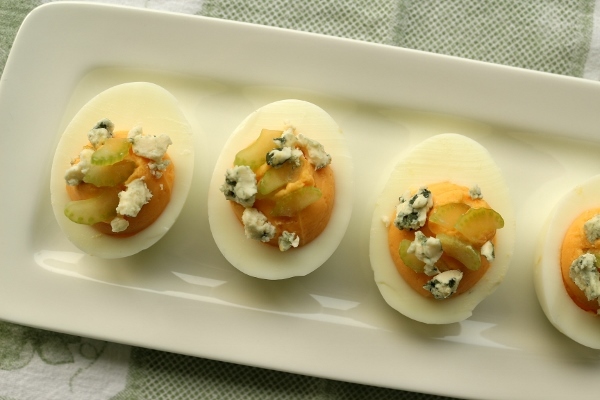 This is a really easy make-ahead appetizer, but it's also wonderful for a breakfast or brunch spread since, you know, they're eggs. I recently made them for a potluck at work because I wanted something savory and satisfying that could be served cold. I didn't want to have to worry about heating things up at work. 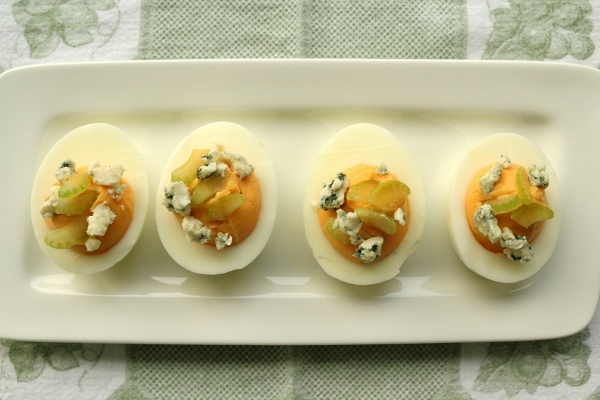 These Buffalo deviled eggs only require a few ingredients. You can definitely embellish on them more if you'd like, but simplicity is underappreciated in cooking, and these eggs are pretty perfect just as they are. The creamy yolk filling is heightened with my favorite go-to hot sauce for all things Buffalo, Frank's Red Hot. The amount I've used here is enough to give it subtle heat while focusing on the vinegary Buffalo flavor. These are not particularly spicy, so if you want them to blow your socks off, add more hot sauce to the filling, and you may also drizzle more hot sauce over the tops as a garnish at the end. 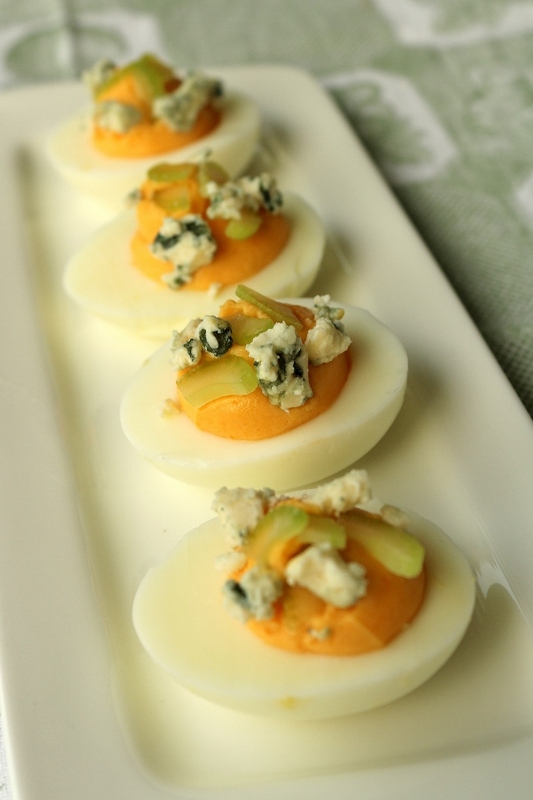 And speaking of garnishes, thinly sliced celery adds a bit of crunch to these soft and creamy deviled eggs, along with a burst of color which compliments the bright orange filling. 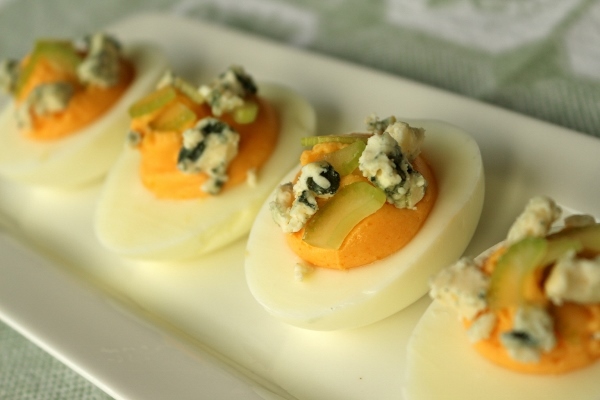 Crumbled blue cheese is the ultimate finish to these eggs, and necessary in my opinion for anything Buffalo. I'm an east coast girl, and while I know they typically ranch it up on the west coast, here it's blue cheese all the way! 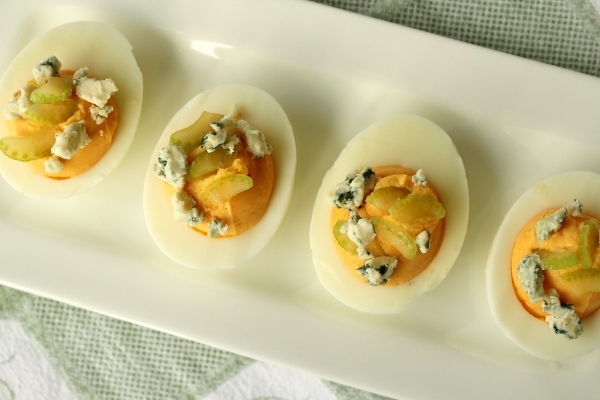 Each bite of these Buffalo deviled eggs is perfection: a bit of heat and Buffalo flavor from the creamy yolk filling, with the obligatory crisp celery and funky blue cheese to finish it off. A match made in Heaven. They will be quickly gobbled up at your next party, Olympic or otherwise. I can guarantee that. Place the eggs in a saucepan and cover with water. Bring to a boil over high heat, then lower the heat to medium and cook for 7 minutes. Drain and run cold water over the eggs to cool them. 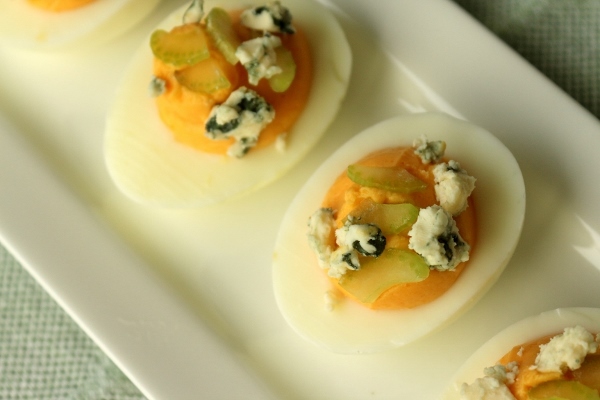 Carefully peel the eggs and slice them lengthwise. Gently remove the yolks and place them in the bowl of a food processor. Set the whites aside on a plate. Add mayonnaise, hot sauce, and salt to the egg yolks in the food processor bowl, then process until smooth and creamy, scraping down the sides occasionally. Taste and adjust seasoning as needed. You can make it spicier with more hot sauce if preferred. Transfer the yolk mixture to a piping bag and snip the tip of the bag (if it's a disposable bag). Pipe the filling into each of the egg white hallows. Top with thinly sliced celery (you may not use all of it) and crumbled blue cheese. 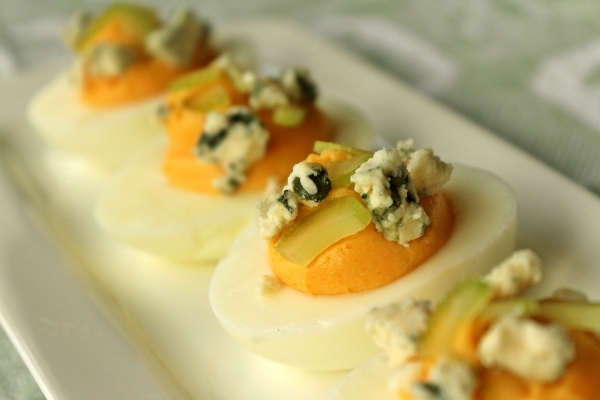 You may also drizzle extra hot sauce on top of each egg for additional spice, if desired. Cover and refrigerate. Serve chilled.